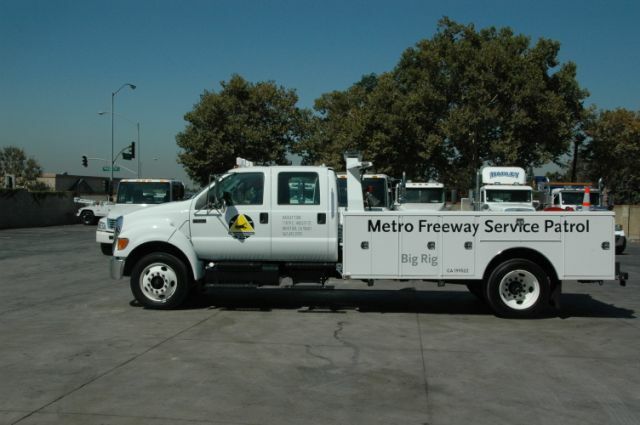 On September 1st Metro’s Freeway Service Patrol (MFSP) Big Rig Truck program will move from a pilot program into a full-fledged operation on the 710 Freeway and new service will be introduced to the 91 Freeway. The pilot program along the 710 freeway that began service in October 2005 was approved by the Metro Board of Directors to reduce traffic congestion and improve air quality in the region. The program provides short-term mechanical assistance, when feasible or provides a tow to a designated drop location off the freeway that will allow disable heavy-duty truck operators to seek long-term assistance from a provider of their choice. The two big rig two-trucks that have been patrolling the 710 average 350 monthly assistance and 220,000 5,500 annual vehicle hours by assisting disable semi-trucks on the freeway. The 91 freeway is the third busiest truck route in Los Angeles County. The new utility truck (pictured above) will be able to pull a semi-truck and trailer out of freeway lanes in an effort to reduce congestion. Press release from Metro Media Relations after the jump. The Metro Freeway Service Patrol (MFSP) Big Rig Tow Truck program expands today to a full-fledged operation along the 710 and adds new service on a 9-mile stretch along the 91 freeway to assists disable trucks operators. The service has proved to be very successful along the 18-mile section of the 710, between the 60 Freeway and Pacific Coast Highway, with two roving big rig tow-trucks operating weekdays from 5 a.m. to 7 p.m. They averaged 350 monthly assists and 5,500 annual service hours assisting disable semi-trucks on the freeway. The new service on the 91 will operate from the 710 freeway to the Orange County line on weekdays between 5 a.m. to 7 p.m. The 91 freeway is the third busiest truck route in Los Angeles County. The configuration of the new tow vehicles also will change from two heavy-duty tow trucks to one heavy-duty tow truck and one utility-truck for each freeway. The new utility truck will be able to pull a semi-truck and trailer out of freeway lanes in an effort to reduce congestion. The contractor for this service is Hadley Towing for a total amount of $9,180, 250 million for two four-year contracts with two options years for a total of six years on both the I-710 Freeway and the SR-91. The services MFSP Big Rig provides are short-term mechanical assistance, when feasible or provide a tow to a designated drop location off the freeway that will allow disable heavy-duty truck operators to seek long-term assistance from a provider of their choice. In addition, MFSP Big Rig will provide limited fuel, water to help remove vehicles out of the freeway in the event of an accident. The MFSP Big Rig is a joint program between Metro, the California Highway Patrol and Caltrans. Metro administrates the program, CHP provides field supervision and Caltrans tracks data for the program. The MFSP Big Rig has been operating in Los Angeles County since 1991 and is the largest of its kind in the nation. For more information on Metro’s bus and rail service and other transit programs visit www.metro.net .For bus and rail schedules call 1 (800) COMMUTE.